FILE - Ice skaters take advantage of unseasonable warm temperatures to ice skate outside at Westchester Lagoon in Anchorage, Alaska, Jan. 2, 2018. While a large part of the county is freezing under Alaska-like conditions, parts of the nation's northernmost state were basking in balmy conditions. Winter is off to a late start in parts of the nation’s largest, and usually coldest, state. Months of higher-than-normal temperatures in parts of rural Alaska have opened dangerous gaps in frozen rivers that residents use to travel from village to village and to hunting grounds because there are no roads. One troublesome ice highway is the half-mile-wide (0.8-kilometer-wide) Kuskokwim River, where a man died New Year’s Eve after he and five family members, traveling on a snowmobile and sled, fell into a gaping hole. The others survived. Search and rescue teams in the southwest Alaska commercial hub of Bethel have been marking holes on the Kuskokwim, but there were so many, they ran out of the $300-a-roll reflective tape. While they wait for more supplies to be shipped, residents in villages along the river and its tributaries have been marking the openings with tree branches. 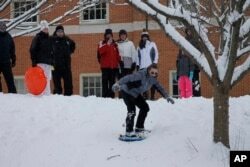 A group of adults and children enjoy an afternoon of sledding and snowboarding on a hill on the campus of Wake Forest University in Winston-Salem, North Carolina, Jan. 17, 2018. It’s a role switch of sorts with much of the lower 48, where dangerously cold temperatures have been blamed for dozens of deaths. The unseasonable warmth in parts of Alaska is a factor in making last month the warmest December on record for the entire state, experts say. The statewide average temperature for the month was 19.4 degrees, far higher than the historical average of 3.7 degrees, according to Rick Thoman, climatologist for the National Weather Service’s Alaska region. Boris Epchook, who has lived most of his 54 years in the Yup’ik Eskimo village of Kwethluk, east of Bethel, said he has seen dramatic environmental changes in the past two decades, but never to this degree. Weather Service data bears that out. Bethel, representative of the region, had the warmest fall and early winter on record. The average temperature for the period between Oct. 1 and the first week of January was 28.6 degrees, far above the 30-year average of 18.3 degrees, according to Thoman. 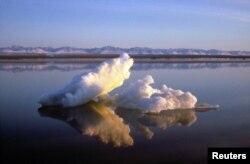 FILE - Sea ice floats within Arctic National Wildlife Refuge, Alaska, undated handout photo from U.S. Fish and Wildlife Service. The sustained warmth speaks to the continuing effects of climate change, which have escalated in a region many consider a harbinger of global warming. Erosion and flooding are nothing new for many remote Alaska communities, which are increasingly vulnerable to melting permafrost and shorter periods of coastal ice that historically protected them from powerful storms. Farther north, warm weather slowed the formation of sea ice above the Arctic Circle, including the Chukchi Sea, which didn’t freeze over until Dec. 31, Thoman said. As in the Bethel area, the changes are disrupting life and hunting patterns in northern communities such as Point Hope, an Inupiat whaling village built on a triangular spit surrounded by the Chukchi, Arctic Ocean and a large inlet. Lifelong Point Hope resident and former Mayor Steve Oomittuk said the changes have been significant over the past decade, most dramatically in the last five years. The sea ice used as platforms by prey animals like walrus and seals is slower to form, making it more dangerous for hunters to venture out, Oomittuk said. The warming also affects ancient traditions. For example, people bring out fermented bowhead-whale tails to feast and celebrate the first forming of slushy ice along the coast. It’s a tradition historically observed in late September or early October in the community of 700. But the past couple of years, the whale tails have come out much later, in November. This season, they stayed in villagers’ ice cellars until three days before Thanksgiving, Oomittuk said. Residents worry about all the changes. The state is shifting to a cooler trend this week.